Is The Game Changing in Mizoram? On 23 May, the opposition Mizo National Front organised an anti-idolatry rally in Aizawl and there was a blast in the Assam Rifles’ temple complex that day. Following the signing of the June 1986 historic Mizo Accord, Mizoram has been a picture of peace, so the new development appears to indicate a subterranean discord that mixes politics, ethnic identity and religion. Little is known to the outside world of these subtle changes in the tune and nuances of politics in Mizoram, but internally it signals a social and cultural fragmentation. On a recent visit to Aizwal, I heard of how its residents felt a sense of insecurity vis-a-vis the haphazard construction of residential buildings in a town that is prone to landslides and the government’s apathy. Their frustration has found expression in action, like Mizo Young Association members taking it upon themselves to drive out Chin refugees from the Lengpui area to make the city crime-free. Anger and grief directed against the ruling party and blaming the growing rates of crime on Chin refugees go hand in hand with the larger picture of social, religious and ethnic fragmentation of Mizo society into many ideologies and groups. Raising the issue of idolatry practised by some Mizo leaders is also a psychological ploy to confuse social insecurity with the loss of faith that afflicts the community. The rally was an expression of ideological differences not only between political parties but also between various social groups and identities. The blast, for which the MNF blamed the ruling Congress, indicates the extent of ideological manoeuvres. The state home minister described the rally as a kind of self-infliction. This is nothing but an ideological contestation of a complex mix of ethnicity, religion and politics that hurts Mizo society. The rally’s main objective was to expose how, during Durga Puja, Congress chief minister Lalthanhawla lit candles at a pandal. Opposition leader Zoramthanga argued that by doing so the chief minister had violated Christian ethics that prohibits the worshiping of idols. He also pointed out that the chief minister’s wife, Lal Riliani, had even put colour on her forehead and broke coconuts. According to him, all this exposed how the Congress was pandering to what the Mizos considered an “evil” and, therefore, outside the Mizo way of life. There’s no gainsaying the fact that in a deeply Christian Mizo society, such public acts of display by the ruling party chief and his family members did not go down well with the masses as it contradicts their belief in Christ. The larger issue of secular practice by heads of a state as per the Constitution has not been broached by the MNF, but it simply hinted at the performance of a ritual that Christians are not supposed to indulge in. This brings us to the issue of the Church’s hold on and influence in the political outlook and choices of the Mizo people as such. 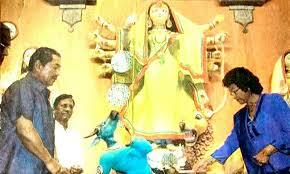 A respected public figure cannot cross that Laxman Rekha drawn by his faith. Going against the deep-rooted faith and belief of the masses by a public leader in the Mizo context is still to be accepted as “normal”. The MNF protest rally simply voices the sentiments of commoners, who are taught not to practice any form of idolatry. All this brings back the issue of the authenticity of being a Mizo, which lies in following God’s commandments. Obviously, in a plural Indian society a narrow and mono-religious notion of God creates tension, both for those who believe and those who do not. Zoramthanga’s reference to Exodus, Chapter 20 — which says “I am the Lord your God, who brought you out of Egypt, out of the land of slavery” — very successfully revived the memory of the abolition of the bawi (slave) system by Christian missionaries as well as invokes the Mizo belief that they are part of the 12 lost tribes that moved out of Egypt. The eschatology of the exodus out of Egypt and the contemporary revival of Bnei Menashe (children of Menasseh) who are lost in India’s North-east and who now reconnect them with the resettled communities of Israel, are believed to be tribes of Manasseh. Such moves in imagination and faith constitute the contemporary sense of belonging to Mizo identity. Having lost two elections consecutively, the MNF is trying to generate mass opinion against the Congress as a practitioner of “evil”. Such political rivalry, as always, centres round a search for roots and an assumption of the right identity-roles that would ultimately decide who wins the ideological battle. In this battle, the idea of election in a Hebrew sense becomes an argument for revival. Election marks a reconnection with the tribes of Manasseh through a journey into Israel’s territory. It also reinvokes the memory of the complex inter-clan relationship during and after the abolition of slavery. Clans such as the Raltes, Sailos, Hualngos, Lenchungs, Zadengs, Pacchaus, Chhakchhuaks, etc, and their complicated role during the anti-slavery movement, Mizo insurgency and their present social status determine the political influence of respective parties. The MNF’s playing the identity card is effectively countered by the Congress’s more prominent strategy of winning over people by its ideology of secularism. So, the whole picture seems to be emerging slowly into a game changing scenario through a carefully crafted ideological battle.